These are by far the best biscuits I have ever made! I couldn’t get over how tender these were – so perfect! Especially considering the last batch I made were so bad I didn’t even post about them. They were that embarrassing – like hockey puck-embarrassing! This recipe couldn’t be easier and there are only two ingredients required (if you use self-rising flour, but if you don’t have that you can make your own). I decided to buy the recommended White Lily Self-Rising flour and I am so glad I did. Apparently, it’s no secret to southern home cooks that this is the flour to use for biscuit making. These rose high and were so fluffy, light and tender – seriously, I couldn’t get over that! 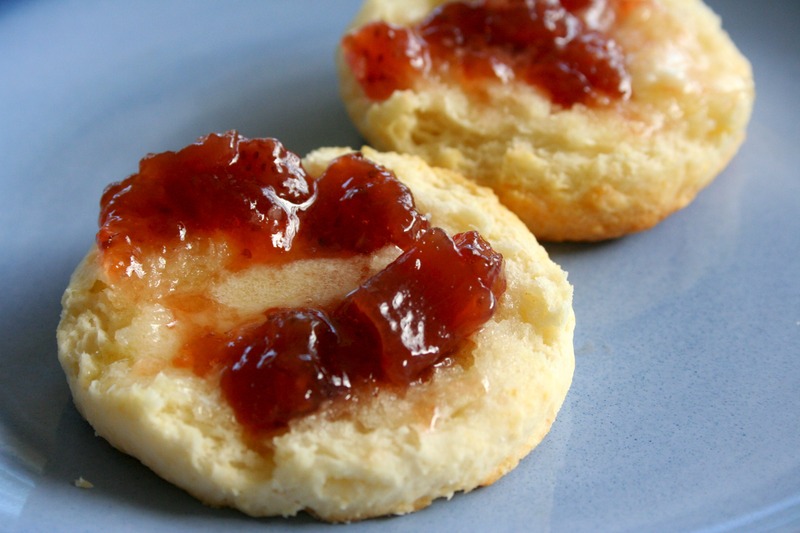 🙂 I am so glad that I finally found a fool-proof recipe for biscuits. Thanks for reading, enjoy! 1. Preheat oven to 450 degrees. Set a rack one level above the middle of your oven. For softer biscuits, prepare a 8 or 9 inch cake pan or oven proof skillet. The biscuits will fit together snuggly, helping each other stay tender but rise while baking. For a crisp overall exterior, select a baking sheet or large baking pan where the biscuits can be spaced wide apart, allowing air to circulate and creating a crisp exterior. 2. Fork-sift or whisk 2 cups of the flour in a large bowl. Make a deep hollow in the center of the flour with the back of your hand. Pour 1 cup of cream into the hollow and stir with a rubber spatula or large metal spoon, using broad circular strokes to quickly pull the flour into the cream. Mix just until the dry ingredients are moistened and the sticky dough begins to pull away from the sides of the bowl. If there is some flour remaining on the bottom and sides of the bowl, stir in 1 to 4 tablespoons of the reserved cream, just enough to incorporate the remaining flour into the shaggy, wettish dough. If the dough seems too wet, use more flour when shaping. 4. Using a metal spatula, move the cream biscuits to the pan or baking sheet. Bake the biscuits for 6 minutes, then rotate the pan so the front is now turned to the back. If the bottoms are browning too quickly, slide another baking pan underneath to add insulation. 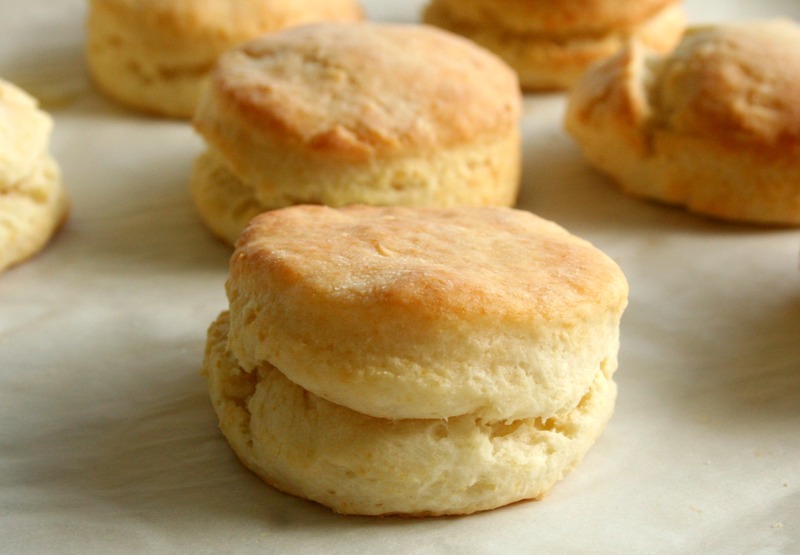 Continue baking another 4 to 8 minutes until the cream biscuits are lightly golden brown. When the biscuits are done, a total of 10 to 14 minutes, remove from the oven and lightly brush the top of the biscuits with softened or melted butter. Turn the biscuits out upside down on a plate to cool slightly. Serve hot, right side up.